The Lakers acquired Brewer from Houston along with their 2017 first-round draft pick in exchange for Lou Williams at the trade deadline, and got 24 games of his traditionally-excellent effort and energy to serve as an example for L.A.’s young players. He scrapped his way around on defense and flew up the court in transition, often a key for the second unit that helped L.A. win five straight games in April. Brewer did struggle to hit 3-pointers, converting just 20.8 percent from distance. Generally a quiet person, Brewer found opportunities to teach L.A.’s young players things he’s picked up over his career on the court during games, at practice and in the locker room. 1.3: Career steals average for the lanky wingman, who managed 1.0 steals per game this season despite playing only 14.9 minutes per game. 277: Consecutive games played for the NBA’s current Iron Man, as Brewer took over for Tristan Thompson (447-game streak) in early April. Brewer last missed a game on Feb. 7, 2014. He’s played all 82 games in three seasons, plus 81 and 80 once apiece in his 10 seasons. 915: More games Brewer would need to play to match A.C. Green’s absurd record of 1,192 consecutive games. Green missed only three games in his 16-year career. Under contract for next season, Brewer and the Lakers would love it if he finds a way to get his jump shot to fall from the perimeter. The issue there: Brewer hasn’t shot over 30 percent from 3-point distance since 2010-11 (30.8 percent). 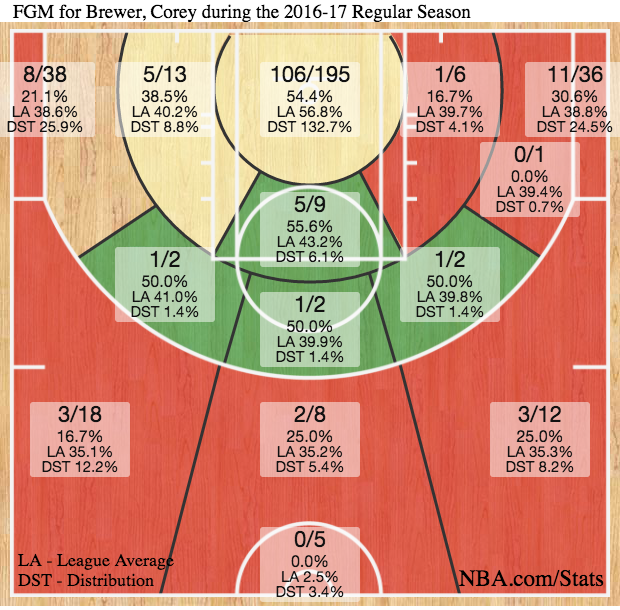 His offensive game in the half court is more dependent upon drives and slashes to the hoop, and more pointedly, his streaks up the floor in transition off turnovers, misses or even makes. Regardless, his work rate on the court is a plus, and often contagious, and often balances his weaknesses as a shooter and ball handler. He’s a good locker room presence for young players that can continue to have a positive impact in that way as well.